Physical Therapy Assistant - Your help or your hinder in home health care - if you lead by example. raising the bar by leading by example. Physical therapy assistants (PTA) can either make or break your home health care business or integrity. That may seem blunt and rude but I've seen a lot in my 15+ years of doing home care PT! Although PTA's are under supervision by a Physical Therapist (PT) and are licensed to function in a similar roll, PTA's have their license defined limits. Initial evalutions are one of them. The physical therapist must evaluate, write up a plan of care and supervise a PTA to follow through with treating the patient, encourageing compliance and attaining goals. All PT's differ in their documentation style. This can create misunderstandings to a Physical Therapy Assistant. At times, personality conflicts, patient location - and a hundred and one other factors may make it difficult to make the PT/PTA team a smooth move. However, as professionals, we must learn to work together and realize that it is up to PTA's and physical therapists alike to begin to redeem the failing reputation of home care therapy. As supervisors, physical therapists must embrace and live out the highest quality work ethic and compassion towards our elderly companions, lead by example, listen to patient complaints and act accordingly if their are problems. Expect It! - 10 Things to Expect From Your Home Care Physical Therapist. that subscribers get a free copy of. Most of it goes for a physical therapy assistant too! 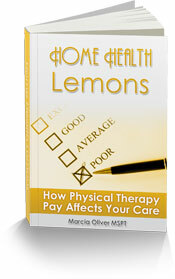 I also wrote Home Health Lemons - How Physical Therapy Pay Affects Your Care. This resource lets the secrets out about how we get paid as PT's and PTA's and how it can affect the quality of care we give them. Patients and caregivers are learning what to expect from us. Integrity in the work place seems to be less and less valued generation after generation. The home health care physical therapy and physical therapy assistant is no different. In a highly unsupervised field, it can be next to impossible to weed out those who are looking no further than their paycheck from those who are genuinely concerned about and care for their patients. As PT's supervising a caseload, some of which PTA's are treating, it is often necessary to make individual phone calls to patients regarding the nature, time and quality of their visits. Other times, you happen on a PTA who is wonderful! I've seen this twice in my career. In fact, the only time I have chosen to work with a PTA in the home care arena is because I had worked side by side with them in a sports med clinic, seen their character, the quality of their work and came to know them as a friend. When time brought us back together with the opportunity of working home care together, I knew I was working with a trusted friend of the highest work ethic and integrity. Here is your chance to help and be helped as you sort the question of PTA/PT teamwork in your own business or career. When you find gold, nurture them and lead by example. Help each other deliver the finest quality of care. Share your experiences and questions below. Or ask a private question here. Your comments, concerns and questions about the vague PT/PTA team in home health care will benefit others wondering the same things. Entering your thoughts about Physical Therapy/Physical Therapy Assistant Teams helps us build strong patients! Role of a physical therapists supervising a physical therapy assistant in the home health setting. Does a PT have to co-sign every note that a PTA does in home health or can it just be a supervisory visit notation every so often? Is your home physical therapist a lemon?